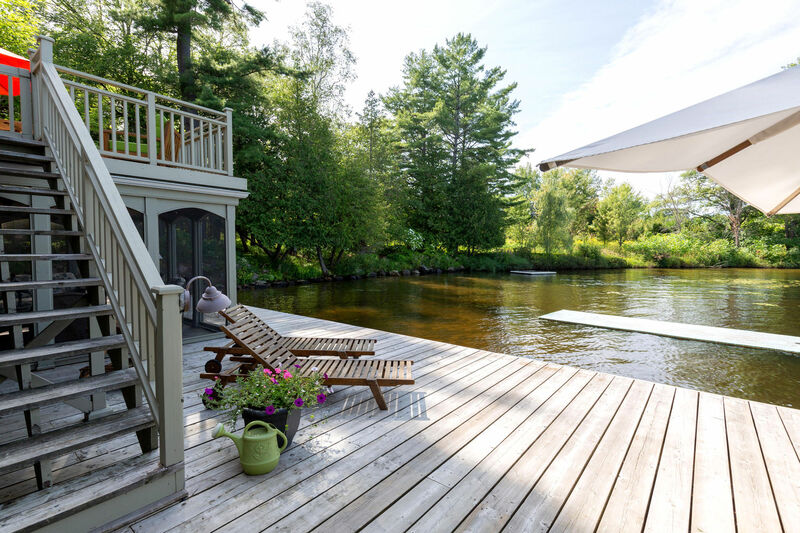 Welcome to this charming 850 sq.ft., 4-season, 3 bedroom cottage on ever popular Lake Muskoka! Perfect and affordable for a small family vacation getaway on one of the much sought after “Big Three” Muskoka Lakes. The interior of the cottage is cozy and as clean as a whistle with all the comfort conveniences of home. The open concept living/dining/kitchen all face out to the lake with beautiful views from a wall of large picture windows running the length of the cottage. This inviting living space is the perfect family gathering area for prepping meals, dining and relaxing with a movie in front of the wood burning stove on cooler evenings. The 3 bedrooms are located in the shaded backside of the cottage lending to a great night’s sleep. The lake facing large spa-like 4-piece bathroom, complete with a claw foot soaker tub, will be the place to kick back and relax after a long day of fun in the sun. 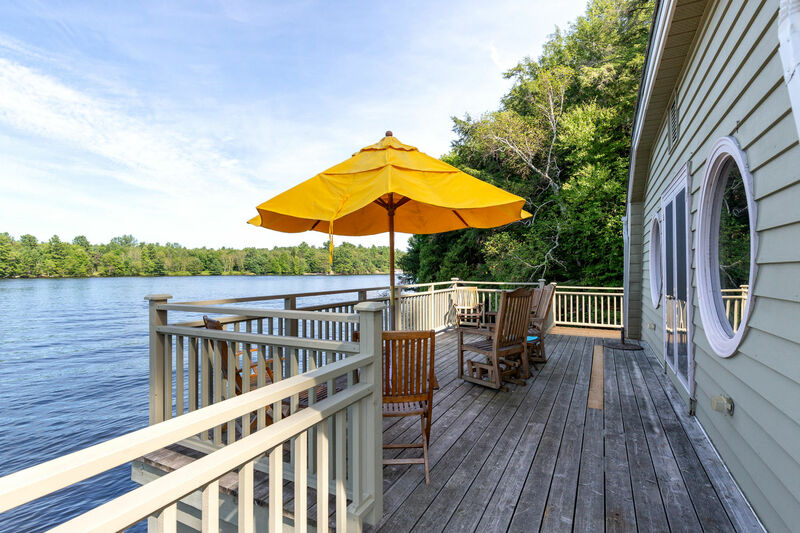 Enjoy your morning coffee and breakfast on the deck overlooking the lake, while taking in the peaceful surroundings as the sun rises before the rest of the lake wakes up and the water fun begins. 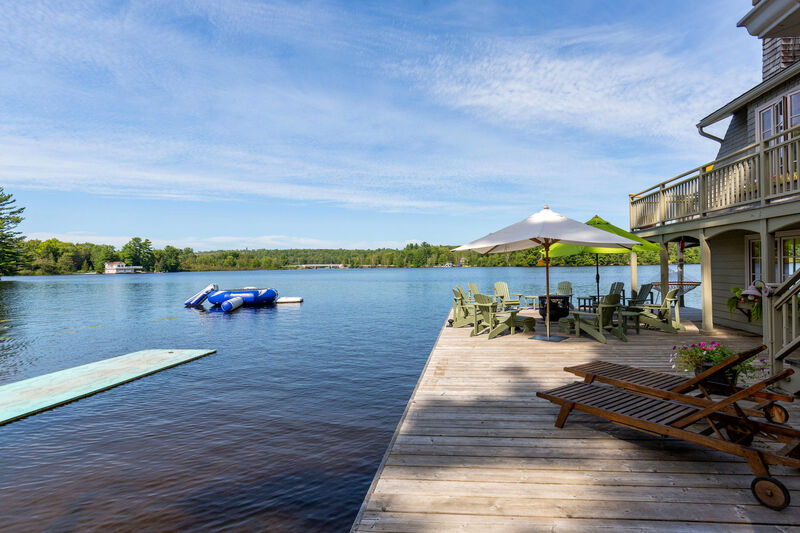 Head down to the dock and 150 feet of classic Muskoka rock and pine shoreline and stretch out on the spacious dock, relaxing in the sunshine while taking in stunning long views across the lake. With 2 kayaks and a canoe at your disposal, be sure to get out on to the water and explore the lake. The smaller kids can comfortably enter the lake to cool off just off of the side of the dock while the older kids can swim off of the end of the dock where the refreshing water is deeper. For avid boaters, you can tour “The Big Three” (Lake Muskoka, Lake Joseph and Lake Rosseau). while stopping at Gravenhurst, Port Carling and many other unique spots. The lake also hosts frequent fishing derbies so needless to say keen fishermen won’t be disappointed. For land lovers, walking and running along the private tree lined road from the cottage is a must and and for the golf enthusiasts there are an abundance of golf courses to choose from in the area. End your days with a BBQ on the deck and gather around the fire bowl as the sun sets and share stories about your day's advenures. The rich cottage history of vacationing on this famous lake is sure to please the whole family! LOCATION: About 2 hours north of Toronto, and just minutes to the town of Bracebridge for shopping, dining, groceries, LCBO, gas and most all other amenities. Close to many great golf destinations in the area. No pets, no smoking, maximum number of occupants is 5, bring own linens and towels, bring own drinking water (1-18L bottle will be provided to get you started), noise restriction after 11 p.m.